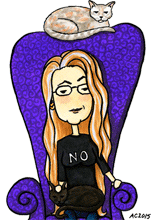 Friday brings us one more new cartoon, the lovely Heidi Dobbs! We had fun with color on her cartoon in a different way than Linda’s — we made her clothes a quiet black but she had me give her the fiery hair she wishes she could have! 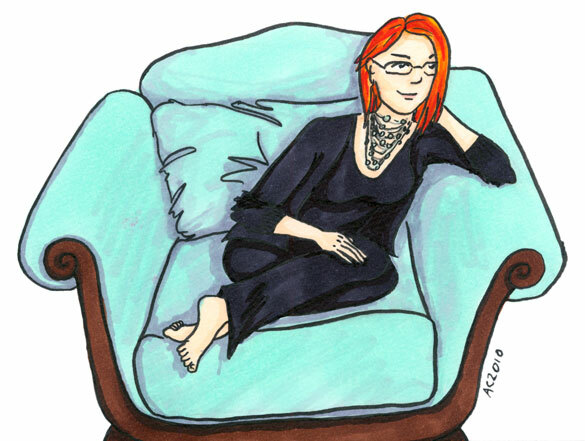 We also took her dog’s favorite snuggly chair and made it a nice robin’s egg blue, a color that wouldn’t stand up to the dog in real life, but makes a wonderful backdrop to her awesome locks in her cartoon. Thanks for coming along on my week of cartoons! This weekend I’ll post a few people that aren’t new, but haven’t been up on this site before. Remember, if you want to be a Cartoon, it’s just $79! My list of cartoons-to-be is filling up wonderfully, and I’m always excited to get a new cartoon client in the queue. Ooh! the robin’s egg blue is gorgeous-the first thing I noticed. And of course, the fiery red hair.